Today’s post is courtesy of my organised self who existed two months ago. She no longer exists so I was going to skip this week until I discovered it this morning. Look the narrator had quite a monotonous voice, but the book is incredible and I fell back in love with it and cried a whole lot so I guess that’s a win for audiobooks. It was narrated by Reese Witherspoon so I survived the American accent (which let’s be honest is how Scout would have sounded). I loved this because it reminded me of how powerful the story really was. This book is in my top ten, and as an audio book, I just felt like all of the characters were speaking to me and we became even closer friends. I hadn’t read the physical book in years but came across the audiobook at the library so I read it. It was nice to catch up with an old world. I once knew incredibly well. Murder mysteries are even more thrilling when there is dramatic music playing in the background. This was very short (45 minutes from memory) and I had forgotten parts of it, so it was like a brand new mystery. This was abridged. Please don’t do that to books. I don’t care how long they are. And especially don’t cut out half of Sherlock’s discoveries and leave his deductions intact. It was dramatised so I was happy. Just saying Stephen Fry is the best narrator ever and would love to listen to the entirety of this series if I had the money to buy it all. The narrator was not the best (although I could listen to the whole thing) but the book is the best and I enjoyed taking the time to stop and listen. 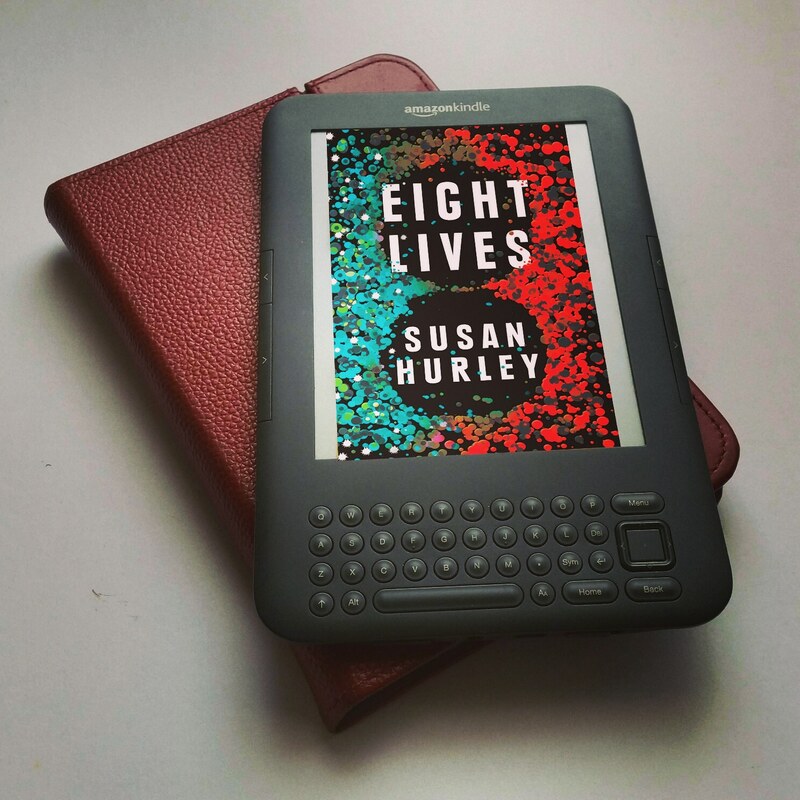 Today’s featured book is Eight Lives by Susan Hurley and I would like to thank both NetGalley and Affirm Press (the publisher) for providing me with this free e-book in exchange for an honest review. By the second half of the book I couldn’t wait to see what happened next and couldn’t put it down. David Tran is the star of Australian medical research and for good reason. He has just developed a miracle drug that will make a fortune for his investors. But right before human trials of the drug commence David dies in suspicious circumstances. The book follows five of his friends trying to figure out how and why he died. I liked having a glimpse into the world of pharmaceutical development and how much work goes into the medicine we take for granted. That it had an unexpected ending reached by about three different twists and turns. It wasn’t until Part 2 that I became engaged in the book (but after that I couldn’t put it down). This book was an interesting read that immersed me into the stresses of life in the medical world and also of those who invest in it. It is a medical ‘whydunnit’. So if murder mysteries or medical dramas are your thing, track down a copy either by pre-ordering today or tracking down a copy after its release on the 26th of March. I love all of the books below, and think that they all work as standalone books. I don’t have any questions that weren’t answered, I just wish their authors would write more so I could see into their world once more. I haven’t read this in about eight years, but I always wanted to know ‘what happened next’ with Sara Crewe. I just want to see Ken and Rilla get married and have babies and fall more and more in love with each other. Is that too much to ask? I mean probably since the author is dead, but that’s a minor detail. I read this the other week, and loved the writing and the way she analysed the war and the way it shaped her generation. Would be keen to see what she thought of the Second World War since she seemed kind of cynical about the League of Nations. Look it’s the ending. I want it changed, or failing that to see what she does next. Fun Fact: Only book I’ve discovered where I liked the movie better. The Book Thief is amongst my favourite books of all time, but I would love to see Liesel grow up and the decisions that she makes, and see how she teaches her children about the war. A book on group friendship is few and far between. Honestly this book was the first time in forever where I had made friends with all the characters by the end of my first read, so I just want to go and hang out with them heaps more. Apparently a sequel is coming which is good, since I’ve been wanting one for ages, but I want it sooner rather than later. In the meantime I guess I’ll have to re-read it. I’d love to re-read this, but I lent my copy to someone and have too many other books to read anyway. I liked the companion novel, but sometimes you just need the same characters in a new book. I will read anything Ally Carter writes, but would be curious to see what else Maddie and Logan get up to far away from Alaska. Would a sequel add anything? Maybe not, but still Australian contemporary with cake? I am there and buying it. Today’s featured book is How Not to be Popular by Cecily Anne Paterson and I would like to thank both NetGalley and Wombat Books (the publisher) for providing me with this free e-book in exchange for an honest review. I started it yesterday afternoon and finished it this afternoon since I couldn’t put it down. This book is about a girl called Maddie who desperately wants to stay a part of the cool crowd at school. At school camp, Maddie is forced to make a choice, just how far will she go to be popular? The book follows her beyond camp, across the school year seeing the choices she makes and the consequences (both good and bad) that they lead to. Being popular has never interested me so I didn’t really connect with the main complication of the book but I know that it is a struggle for many girls in the target audience so I’m grateful that I never experienced that struggle. This book was a most wonderful and refreshing read. It’s a book about friendship and growing up well, even when life is hard or you’ve made poor choices. This book comes out next Friday, so go pre-order your copy today. If you’re curious about Australian life, go buy it. If you are Australian, buy a copy to take a trip down memory lane, or find a new friend your own age. Buy a copy for a tween girl in your life or for yourself. It’s currently among my favourite books of the year. Today’s featured book is The Last Days of the Romanov Dancers by Kerri Turner and I would like to thank both NetGalley and Harlequin Australia (the publisher) for providing me with this free e-book in exchange for an honest review. I finished it earlier this week and it came out just over a week ago. This book is told from two different perspectives, that of Valentina Yershova and Luka Zhirkov. Both were born peasants but through talent have come to be part of the Imperial Russian Ballet company who receive the support of the Romanovs. These two ballet dancers walk the line between a world full of all that glitters and a world full of whispers of discontent and dissatisfaction. History tells us who the winners will be, but these two dancers must decide on which side of history they will fall. The fact that the storyline kept me engaged the entire way through. I got an insight into early 20th century Russian contraceptive methods. This book was a fascinating read. I loved learning about Russian history and the difficulties in trying to succeed in the cutthroat world of the ballet. I thought the author did a great job at positioning me in both the opulence and extravagance as well as the extreme poverty that existed in Russia. I found the book engaging and if you want to read a book about romance and revolutions, then this might be a book for you.